You just find that perfect location for your wedding or function, and we will do the rest. We provide everything you will need from the floor to the roof. We can service the Central Lakes District & beyond. Wanaka Party Hire has all the wedding hire requirements you need to make your Wanaka wedding day a success. 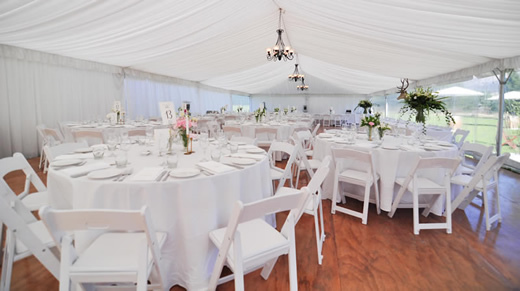 You can choose between a open marquee to enjoy the fresh air of the summer or centrally heated in the winter for you and your guests comfort. Our marquees can be fitted with a silk roof and wall lining for that romantic look. We can enhance the setting with lights which will add that special touch to a outdoor setting for a garden wedding, casual beach wedding or special outdoor function.